A poll published earlier this year — before the new law came into effect — showed that only 5 percent of Spaniards supported the fiesta. Meanwhile, only 19 percent supported organized bullfights, down 10 points from just three years earlier. A large demonstration in Madrid against bullfighting and other animal-baiting festivities in early September is evidence of a growing awareness of animal rights. Plaza de toros de Acho in Lima, Peru — the oldest bullring in South America, dating back to 1766 In November 1567, Pope Pius V issued a papal bull titled De Salute Gregis and forbidding fighting of bulls and any other beasts as the voluntary risk to life endangered the soul of the combatants, but it was abolished eight years later by his successor, Pope Gregory XIII, at the request of King Philip II. Bullfighting was introduced in Uruguay in 1776 by Spain and abolished by Uruguayan law in February 1912. Bullfighting was also introduced in Argentina by Spain, but after Argentina’s independence, the event drastically diminished in popularity and was abolished in 1899 under law 2786. Bullfighting was present in Cuba during its colonial period, but was abolished by the United States military under the pressure of civic associations right after the Spanish–American War in 1901. Bullfighting was also banned for a period in Mexico in 1890; consequently some Spanish bullfighters moved to the United States to transfer their skills to the American rodeos. 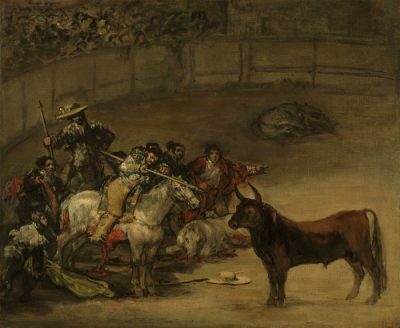 During the 18th and 19th centuries, bullfighting in Spain was banned at several occasions (for instance by Philip V), but always reinstituted later by other governments. Bullfighting had some popularity in the Philippines during Spanish rule, though foreign commentators derided the quality of local bulls and toreros. Bullfighting was noted in the Philippines as early as 1619, when it was among the festivities in celebration of Pope Urban III’s authorisation of the Feast of the Immaculate Conception. Following the Spanish–American War, the Americans suppressed the custom in the Philippines under the tenure of Governor General Leonard Wood, and it was replaced with a now-popular Filipino sport, basketball. Bullfighting is now banned in many countries; people taking part in such activity would be liable for terms of imprisonment for animal cruelty. “Bloodless” variations, though, are permitted and have attracted a following in California, Texas, and France. 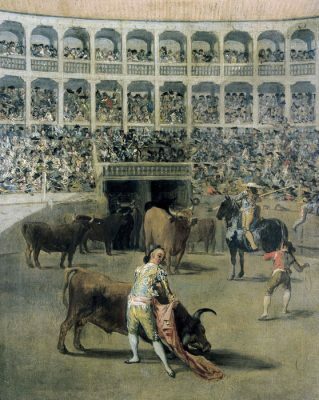 In southern France, however, the traditional form of the corrida still exists and it is protected by French law. However, in June 2015, The Paris Court of Appeals removed bullfighting/”le corrida” from France’s cultural heritage list. While it is not very popular in Texas, bullfighting is legal (the only U.S. state to allow it), and both bloodless and pure forms of bullfighting occur at rodeos in small Texas towns. In 1991, the Canary Islands became the first Spanish Autonomous Community to ban bullfighting, when they legislated to ban bullfights and other spectacles that involve cruelty to animals, with the exception of cockfighting, which is traditional in some towns in the Islands. Some supporters of bullfighting, and even Lorenzo Olarte Cullen, Canarian head of government at the time, have argued that the fighting bull is not a “domestic animal” and hence the law does not ban bullfighting. The absence of spectacles since 1984 would be due to lack of demand. In the rest of Spain, national laws against cruelty to animals have abolished most blood sports, but specifically exempt bullfighting. Several cities around the world (especially in Catalonia) have symbolically declared themselves to be Anti-Bullfighting Cities, including Barcelona in 2006. This was symbolic, as the city did not have the power to stop it. However, on January 1, 2012, it became prohibited in Catalonia (including Barcelona, the capital of this region) after a ban passed in the Regional Government in July 2010 came into effect in 2012. On December 18, 2009, the parliament of Catalonia, one of Spain’s seventeen Autonomous Communities, approved by majority the preparation of a law to ban bullfighting in Catalonia, as a response to a popular initiative against bullfighting that gathered more than 180,000 signatures. On July 28, 2010, with the two main parties allowing their members a free vote, the ban was passed 68 to 55, with 9 abstentions. This meant Catalonia became the second Community of Spain (first was Canary Islands in 1991), and the first on the mainland, to ban bullfighting. The ban took effect on January 1, 2012, and effects only the one remaining functioning Catalonian bullring, the Plaza de toros Monumental de Barcelona. It does not affect the correbous, a traditional game of the Ebro area (south of Catalonia) where lighted flares are attached to a bull’s horns. The correbous are seen mainly in the municipalities in the south of Tarragona, with the exceptions of a few other towns in other provinces of Catalonia. The name correbous is essentially Catalan and Valencian; in other parts of Spain they have other names. There is a movement to revoke the ban in the Spanish congress, citing the value of bullfighting as “cultural heritage”. The proposal is backed by the majority of parliamentarians. In Costa Rica, the law prohibits the killing of bulls and other animals in public and private shows. Ecuador staged bullfights to the death for over three centuries due to being a former Spanish colony. On December 12, 2010, Ecuador’s president Rafael Correa announced that in an upcoming referendum, the country would be asked whether to ban bullfighting; in the referendum, held in May 2011, the Ecuadorians agreed on banning the final killing of the bull that happens in a corrida. This means the bull is no longer killed before the public and is instead taken back inside the barn to be killed at the end of the event. The other parts of the corrida are still performed the same way as before in the cities that celebrate it. This part of the referendum is applied on a regional level, meaning that in regions where the population voted against the ban, which are the same regions where bullfighting is celebrated the most, killing the animal publicly in the bullfighting plaza is still performed. The main bullfighting celebration of the country, the Fiesta Brava in Quito was still allowed to take place in December 2011 after the referendum under these new rules. Bullfighting has been banned in three Mexican states: Sonora in 2013, Guerrero in 2014, and Coahuila in 2015. Animal activists have protested against Jallikattu over the years. The Animal Welfare Board of India filed a case in the Supreme Court of India for an outright ban on Jallikattu because of the cruelty to animals and the threat to public safety involved. On November 27, 2010, the Supreme Court permitted the Government of Tamil Nadu to allow Jallikattu for five months in a year and directed the District Collectors to make sure that the animals that participate in Jallikattu are registered to the Animal Welfare Board and in return the Board would send its representative to monitor over the event. The Government of Tamil Nadu ordered that ₹2 lakh (USD $3,000) be deposited by the organizers in case of an accident or injury during the event and enacted a rule to allow a team of veterinarians would be present at the venue for certifying the bulls for participation in the event and to provide treatment for bulls who get injured. The Ministry of Environment and Forests issued a notification in 2011 that banned the use of bulls as performing animals, thereby banning the sport. But the sport was continued to be held under Tamil Nadu Regulation of Jallikattu Act No 27 of 2009. On May 7, 2014, the Supreme Court of India struck down the state law and banned the sport. The Supreme Court noted that any flouting of the ban should result in penalties for cruelty to animals under The Prevention of Cruelty to Animals Act, 1960. The court also asked the Government of India to amend the law on preventing cruelty to animals to bring bulls within its ambit. On January 8, 2016, the Ministry of Environment and Forests permitted the continuation of the sport under certain conditions effectively ending the ban.